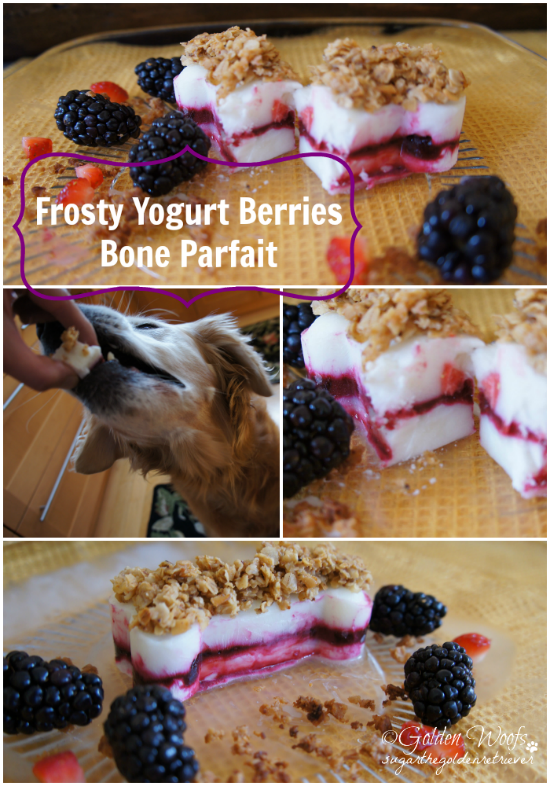 As a reward for my good backyard behavior, my mom made me a DELISH Frosty Tasty Treat. Every morning, I watch mom eat her yogurt parfait. What is a Yogurt Parfait? Parfait is a French word literally meaning “perfect” that began referring to a kind of frozen dessert. A Yogurt Parfait typically consists of some breakfast staples: yogurt, granola, strawberries and blueberries. While mom enjoys her yogurt parfait, I got her thinking that she should make me one. She did, a Frosty Yogurt Parfait. Use a Bone cookie cutter as a mold. Place it on a flat surface, we used a clear plate. 1) Pour into the mold ~ 1 tablespoon of Greek yogurt. Freeze it for about an hour. 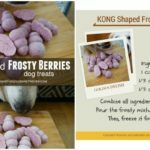 *This is the first time we used Greek yogurt for frosty paw recipe. 2) Pour ~2 teaspoon of the fresh blackberries juice. Smashed blackberries can be added too. Freeze it for about 20 to 30 minutes. 3) Place little pieces of strawberries. 4) Pour ~1 tablespoon of plain yogurt. Freeze it for 20 minutes. 5) Place the tasted oats on top. Freeze it for another 10-15 minutes. It was my treat for the day (whole day). Mom believes in portion control. She cut it into four pieces. I had one piece for breakfast, mid morning snack, after nap snack and evening meal dessert. It was DELISH! TASTY! The little pieces of strawberries inside and toasted oats were delightful. Using Greek yogurt as the first layer gave a thicker texture and it tasted GOOD! Sugar, You always get the coolest treats! (Get it?!) Really, though, that looks awesome. I’ve got some begging to do now…. Oh I know I would not be disappointed. 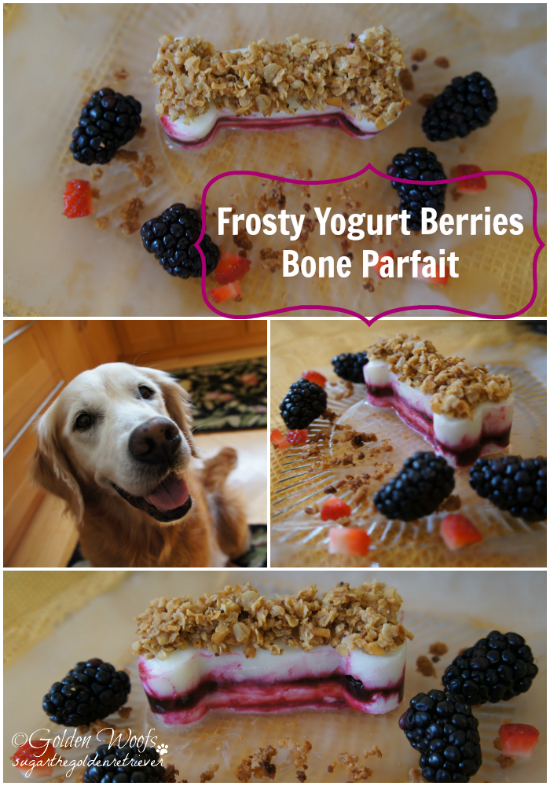 OK this weekend I am getting MOM on to making this yummy tasty drool-a-rific treat. 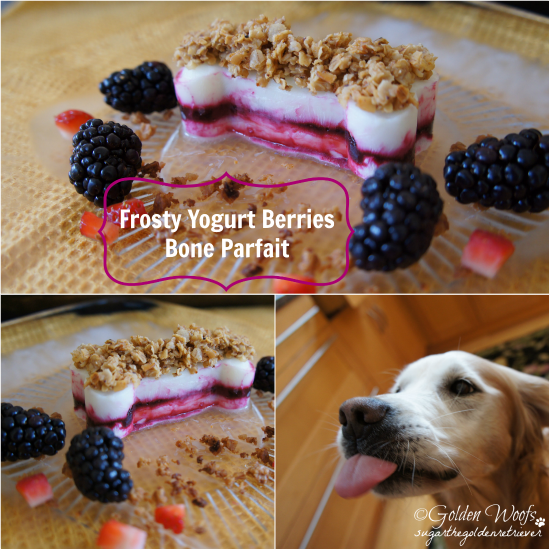 SlimDoggy was just yumming on some Greek yogurt today – not as yummy looking as these, but yogurt is still one of the best treats mom gives us! There are two Labradors presently flying to Chicago to eat your mom’s amazing treats!!!!! Sugar! You are so stinkin’ cute! No wonder you look so happy; these look delish. Thanks so much for sharing this with us Sugar! It looks fabulous!! Now we are hungry! Please let your mom know that we are sorry we didn’t do a Tasty Tuesday…but mama isn’t up to her usual speed these days. Thanks. oh and of course the peeps could attend as long as they had ‘parfait’ manners. Mmmm your food always looks so delicious Sugar! Wow, Sugar! You are one lucky pup! That looks delicious! My guys have to settle for a couple of tablespoons of their human’s breakfast smoothie that has none of that lovely presentation. not only does it sound good but it looks beautiful to… your mom is so good to you. those look good enough for the peeps to eat – but heck – why we would want to share ! Yum….your Mom makes the best treats, Sugar! We hope to have fresh blackberries and strawberries from our garden/yard this year, so we will definitely save this recipe! We love fruit and yogurt, those look really tasty. That looks fabulous as always Sugar. We think your mum needs to write a cook book. Everything looks so good. Have a terrific Tuesday. Wow, these look delish! I wonder if Splotchy would share? I’m going to try these as soon as possible. We want to hire your mom to come and be our chef! Awwwww Sugar you have the SWEETEST MOM in the whole world.. Portion control???? 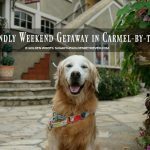 I am in a golden faint at the mere thought of it… BOL! That looks super yummy and healthy! We licked out mom’s yogurt container every morning, I get the lid and my sister gets the container. We love yogurt and fruit too! You have such beautiful (and so tasty sounding) creations!!! Zeus wants to come visit you for a week! Your Tasty Tuesdays always make us hungry! 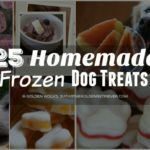 Well that certainly looks YUMMY Sugar, there are so many different ways to make the frozen treats too, you could substitute so many different things so you’d have the same but different treat. Happy Tasty Tuesday to you!! Your mom rocks Sugar. She takes such wonderful care of you. I like that. Our Little Bit does too. Sugra that’s really PARFAIT – I love it. Hope mom will make me such a thingy on mothers day :o) Have a tasty tuesday!!! Wow, I’m drooling all over my Mr Dell! Those look fruity and delish! Enjoy. So do you rent out your momma for chef services? Mine won’t make all these nommy treats for me! Your Mommy makes yummy looking artistic treats, sweetie=is she a professional baker or chef?…You are a lucky girl in many ways, lovely Sugar!..Happy Tuesday, darling friend…kisses…Calle Halle, Sukki. Wow that does look yummy! Your mom makes the bestest treats – no wonder you are so sweet! Ohhh, now I need a drool rag Sugar…..
Okays, that’s better ~ those just look like the bestest treats EVER!! And, I loves that you gots to have a taste all day long! That is the best, always somethin’ to look forward to! I’de like to eat your frosty bone treats myself! Does your Mom eat the same oats she put on these treats in her own perfect parfait? Oh Sugar, you are so lucky that you have a talented mom. My Ma never makes me anything so beautiful t eat. *sigh* I hope you enjoyed your yogurt parfait. It looks so yummy and it’s so pretty, Sugar! You are a very lucky girl! *drool* NOM NOM NOM. I can eat those too, right? Holy Cow Sugar that looks wonderful. I should do that for Gamblers 2 yr birthday next week.